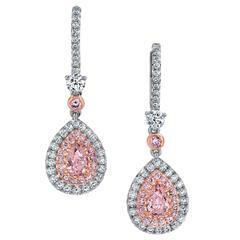 Show your love with these beautiful earrings, which feature 0.32 carat pink heart shaped diamonds, surrounded by halos of pink and white diamonds. Additional diamonds in the decorated under gallery make these earrings beautiful from all angles. Total diamond weight 1.15 carats. 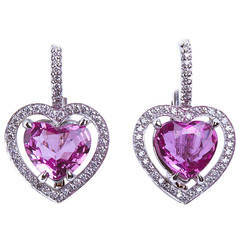 Many of our items have matching companion pieces. Please view our other listings for more information, or let us know if you have a wish list item for us to fulfill! GIA certification has been obtained for the two stones indicated in the last photo. GIA certification is a true mark of global distinction and a credential symbol of knowledge and trust throughout the jewelry industry.